Welcoming auspiciousness and the festive fervor, leading General Entertainment Channel - Zee Kannada is all set to celebrate Ugadi with a grand celebration at Ugadi Swara Sambhrama. The musical event will bring together the wonderous musical talent of the Kannada industry in a never-seen-before avatar as they present the perfect blend of joy and entertainment to your homes. The program will be telecasted between 8:00 PM and 11:00 PM on 6th and 7th April (Saturday & Sunday) exclusively on Zee Kannada. 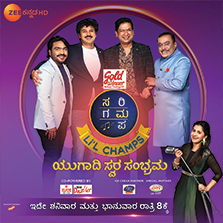 Hosted by the exuberant Anushree, the program will witness the coming together of leading musicians including Arjun Janya, Rajesh Krishnan, Vijaya Prakash and Maha Guru Hamsalekha. The performances of the talented Sa Re Ga Ma Pa prodigies from Season 15 and Season 16 including Keerthan Holla, Nihal Tauro, Vijeth, Hanumantha, Chennappa and Sunil will be the highlight of the program. Vijay Prakash, Arjun Janya and Rajesh Krishnan are not only taking part in this blissful event as judges but also will be performing to amuse the audience. The program will also encompass a special dance performance by the Anushree. The event, which was held at the Nandi Link grounds in Bengaluru, will also showcase a special announcement wherein Hanumantha has been selected as the Election Commission's Brand Ambassador for Haveri district with further details being unveiled during the telecast of the program.